I've published a page you'll find linked in the top menu to a list of articles I've posted on this blog. I will be using it as a reference page for myself - quick browser search to find content I know I have and need some syntax from. I've had this drafted for a long time, but for some reason it wouldn't publish. I had a moment of inspiration and just re-created the page. November 2012 was the launch of a new APEX book from Packt publishing. Kudos to authors Learco, Iloon & Alex. I'd like to offer the following review. Front page - title & byline to the point; three author contribution - nice to keep things balanced. I'd probably buy it without looking at the contents. Sometimes it's a shame not to still discover these books for the first time on shelves. Not just your obligatory first chapter on setting up APEX - it covers plenty of best practices just in this first chapter. It doesn't go into a huge level of detail - it's not going to be the one-stop-shop for all information, but awareness is key. For this reason it is actually quite a large chapter! Instrumentation is what every application should have - the APEX team includes some by default, and the database data dictionary views are also considered instrumentation. This chapter first covers Tyler Muth's logger package - although I would have liked to have read some use case scenarios to really seal the deal. It then breaks down how to speed up your lookup tables with hash clusters and/or index organised tables - don't sound too scared. It does scratch the surface and explains it fairly well, but I recommend further research. I think analytic functions are a little like learning to ride a bike. The authors do fairly well in explaining what they're all about, then provide some good examples - especially a cool one combining row_number() and pivot, and another on the essential string aggregate listagg(). In the caveat section, they show an example of analytic overkill - using row_number() to identify duplicates when "group by" will do. However, there is an advantage in using analytics if you need to identify the primary keys as well. 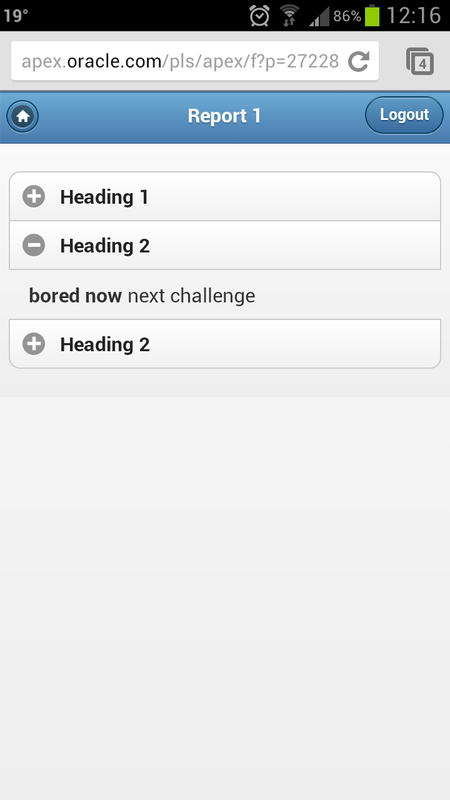 The authors then cover group by features such as grouping & rollup/cube. Quality goes on with describing how to use scheduled jobs to encapsulate longer running jobs the user does not need to wait for; then looks at another favourite of mine - pipelined functions. The chapter finishes with a look at ordsys for image processing & context indexing for document content searching just like google. To illustrate how useful & ubiquitous this chapter is, I already used most of these features in a recent APEX project - instrumentation, pipelining, analytics, ordsys, jobs. 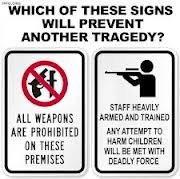 The most common question with the least definitive answer. It quickly turned into a reference manual installation guide, but why not? - it explains the process well. There are good nuggets of information in this chapter, just depends on what you're looking for: BI Publisher, Apache FOP, Oracle Reports, Cocoon, JasperReports & two plug-ins, Reports to PDF & Embedded PDF. My only complaint - there was only a brief note on the 32k limit for report columns. This means images you source dynamically from the database must be less than 22k + message fluff. This is what I experienced in 4.1, and it would have been nice to have dedicated paragraph on the matter - but there is plenty on the web! I spoke too soon!! Writing this as I went along, I came to a brilliant summary of the 32K limit. Good intro, and great quote to start "Oracle Application Express is secure, but developers can make it insecure"
The second half covers the tools a developer needs to be aware of. It has great coverage for cross site scripting (XSS). For added humour, the authors referenced an XKCD comic to illustrate SQL injection. A few authorisation aspects not normally covered were in there. A couple of third party suggestions added to the end. Starts with good detail on debugging in APEX. Later some browser extensions are mentioned - but I prefer the inspection tools native to Chrome. It has only a small section on error handling, but really covers or at least mentions everything an APEX developer should be aware of. Another topic that probably needs more good published content, and the authors again do a good job. Given the quality of the other chapters, I was looking forward to a deeper discussion regarding application IDs, particularly related to Interactice Reports. 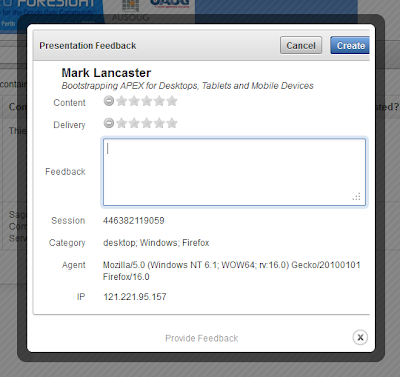 They cover feedback well, but miss migrating it between environments. They also mention my favourite APEX activity report though - Weighted Page Performance. In regard to pro-active monitoring, I think error handling should have been be covered - with this we could log errors and actively notify the development team before the user picks up the phone to support. The appendix, while probably vestigial in humans, here includes some interesting supplementary information on the Oracle Cloud Service, RESTful web services & a super quick mention of the data load feature in SQL Workshop. Buy this book. Perfect information if you are intermediate to advanced, but what should be a required read for all APEX technologists. Kudos to the authors & publisher. I've been technical review for some others, which I should also write up a light review for the blog. No doubt about it, APEX 5 could be the opportunity to really think number 5 is alive! If you missed it, I commented on the statement of direction. It's a good list, and I still think the APEX product team have their fingers on the pulse regarding what the community needs & wants. The APEX 4.2 wish list was certainly a success when it came to encouraging the community to speak out with what they wanted. There were many features suggested, all with varying degrees of complexity in regard to fitting in with the current data model & infrastructure. I have drafted a retrospective post to analyse some hits & misses. Oracle now provides a dedicated application to listen your APEX feature requests. There is a similar one for SQL Developer. I'm interested in something a little broader. I'm asking if the APEX community could have one major change applied to APEX 5, regardless of what the poor elves in Oracle development need to do under the hood to make it happen, what would it be? With the introduction of mobile applications with user interfaces, the bar has been raised. What big change would you like to see in APEX 5? As I did last time, I mentioned this on the OTN APEX forum - but I encourage you to use the Oracle's feature request application to manage these ideas, allow the community to help assess their viability & popularity, and help see some into fruition. You'll get more awareness for these ideas using the application than relying on post 42 on 18 pages of posts, but it would be nice to see your big ideas repeated as comments/forum posts regardless to help seed activity. The APEX development team are are listening. Migrating APEX applications between environments can be a real pain, especially when it comes to Interactive Reports. Oracle gurus Joel, David & Martin have previously commented on this, links in references below - but I'd like to describe a situation we found that may help others. We have an APEX application that migrated periodically, and we didn't maintain a specific application ID during the migration process - a method that I find makes migration simpler. At one point we had users begin to use the IR saved reports feature, so we had to now make sure these reports were preserved during migration. When migrating an application to prod considering behaviours described in David's post, our save reports were still lost. This was ultimately due to the fact the application in development was copied (snapshots of old versions) since users started using saved reports - so our application ID and hence region IDs were different. We considered the issues raised in Joel's post regarding the apex_application_install API and offsets for metadata IDs, but it didn't help in our case. We got a little inspiration from Martin's post, but our situation seemed a little different. We imported the production application with the saved private reports to development. Then I updated the core table to align the flow_id to match, similar to Martin's suggestion - and in hindsight I see were I crossed the wires. Just like Martin said, we still had to match the interactive report region_id to the worksheet children. Hopefully this screenshot paints the picture, where the IDs in green needed to match, as do the application ID. We initially missed the region_id -> worksheet_id, and if I recall that left us with orphaned records after the migration. 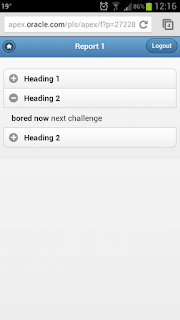 Once updated, we then migrated the application from development, including the saved reports we copied from production. So now when migrating subsequent updates to the application, we don't include private IR reports from development - and it doesn't overwrite/lose whatever is in production. I would like to see the APEX development team improve this process regarding saved reports, perhaps similar to the way questions are asked during import/export regarding supporting objects. Our users would also like the ability to share saved reports to selected groups of people. I wonder if logistics would allow this for either authorisation schemes, APEX user groups, or some other mechanism. Joel Kallman - Where did my saved interactive reports go? You can still manage much of your APEX workspace from the command line - whether that be SQL*Plus, SQL Developer, or some other tool of choice. They key thing is, not everything needs to be point and click - that feels a little important. I like to frequently blow away & re-create a bunch of users, workspaces & applications in one foul swoop. I'd like to share a little of what I've done since it was a topic of discussion recently at the Perth APEXposed. 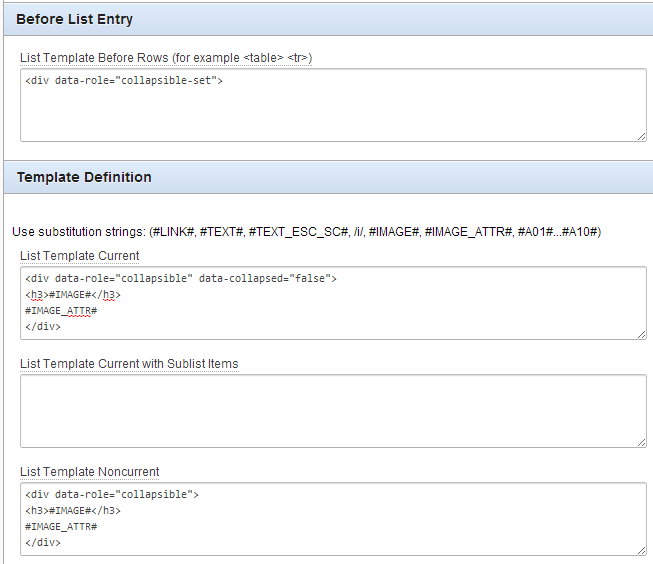 To use the APIs below, your schema will require the APEX_ADMINISTRATOR_ROLE, described by Martin here. To create & define all the training accounts, I use the following procedure in a package I compile in my parsing schema. Privileges are a little different when encapsulated in a package, so direct EXECUTE access on APEX_INSTANCE_ADMIN would be required to avoid the infamous PLS-00201. Permissions such as CREATE USER would also be required. 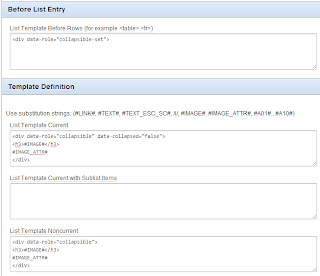 All my other procedures just encapsulate the following steps and example API calls. I highly recommend specifying formal parameter names as the signature to these APIs often between APEX versions. Create a number of users, with various developer privileges. And that's essentially how I do it, just bundled up to suit my needs. It'll be pretty easy for you to grab what you need and sort out your own scripts. The Oracle Application Express statement of direction was just announce by David Peake, I thought I'd share some initial thoughts. Drag and Drop Layout Editor - Introduced in 3.0, removed in 4.2 (probably as a result of component view re-design) I didn't use this much, but with the advent of the grid layout, this feature will probably evolve into something quite useful. HTML5 Capabilities - many mobile presentations last year rightly commented on the importance of HTML5. The 4.2 release is a little under-cocked when it comes to native capabilities, so it will be interesting to see what they include. PDF Printing - external reporting options have always been lean with APEX. It seems now the APEX Listener is evolving, so can the cohesiveness for FOP support. Web Services Support - another area that improves with the growth of the APEX Listener. Tablet User Interface - perhaps I was too forward thinking when I suggested TVs might be the next interface. Tablets are seemingly more ubiquitous than laptops these days, and it seems the three major devices sizes (in regard to screen/workflow design) are mobile; tablet; desktop - so it seems prudent to have a UI and features applicable to tablet devices. Packaged Applications - going hand-in-hand with the Oracle Cloud Service, of course this will improve. No doubt the APEX team also uses these applications as practice/alpha testing for future releases. New multi-row region type - wow. I'm racking my brain trying to imagine what this may look like - I have a few ideas, but I'll just keep re-reading their sentence: "Define a new region type with a modern UI for updating multiple rows of data and allow multiple regions on one page"
Master / Detail / Detail - provid the ability declaratively define these - sure, why not. David seems to like them. Multiple Interactive Reports - I think this has been a long time coming for a few people, and it was only yesterday I imagined an a need that interested me - multiple smaller regions utilising only the Detail View. Application Builder Security - I heard David mention this at the APEXposed conference in Melbourne. I can see the yearn, but I don't particularly care. Though I'm sure I'd use it if it was there. Numerous functional improvements - they're usually the ones that quietly surprise us as we move around the builder. Another thing to consider as David mentioned, if you have any particular features you would like in the next release - there is a APEX Feature Request application. Get in there - I've submitted a few myself. Maybe hit up the wish list forum thread for ideas. APEX is also a standard feature of the Oracle Database, therefore the support guidelines for APEX are similar to those for the DB. Check out the support policy, too - for example, premier support for APEX 3.x expired in Feb 2012. If you're interested, I've commented previously on this for 4.2 and 4.1, since this is now my predominant tool of choice. Maybe I'll look at those later and see how things have panned out. Oracle Forms is a product that has shown staying power, but because the product is aging, support is waning, and new products are coming to replace it - there is little need for new features. 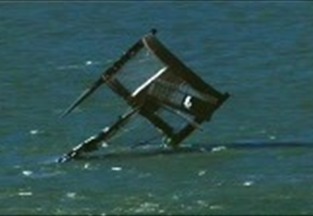 Those that do come out are often esoteric - there to fit highly specific solutions, or help wire in to the newer systems. I wonder what adjustments might be made to accommodate 12c? Probably something under the hood regarding pluggable databases. So nope - not a post about new features of a product like APEX, but a consideration to a product that helped us get there. Thanks to ODTUG, we had the pleasure of part-time Aussie David Peake, who happens to be an Oracle product manager for APEX, & Canadian ACE Director Martin Giffy D'Souza from ClariFit. They were here to conduct 2 rounds of APEXposed - one in Auckland, then Melbourne. With thanks to Bambi Price and other user group committee members - visitors from many states were ushered into a room with 2 large screens, great room width but only 5 or so rows - it worked. Compliments also to Cliftons, I liked the venue. And those chocolate things on day 1 arvo tea - yummo. I was a little unsure what the level of detail would be, and the ODTUG team anticipated this an apologised in advance for not meeting everyone's needs & wants - which I thought was great. I think a few people suggested separate advanced session for next year. For me this was mainly a repeat of recent conference material, and a little "yeah come on, get on with the good stuff". Although I did note that I should have a fresh look at the Collateral section on OTN. It was also good to hear David's displeasure for tabular forms matches with mine. I think it may be a while before I create any item or DA plug-ins, but Security & process plug-ins may be on the agenda. It was brilliant to have someone who wrote a book on plug-ins to describe the mechanics of these magical components. For those that missed it, here is the link to the APEX Builder plug-in. I'm a regular user of SQL Developer for mainly SQL tasks, and occasionally re-engineer data models from the database with SQL Data Modeler, but I was interested to see what David had to show. I got a little bored of mentions to the cloud, as interesting as it would be to have a piece. Brilliant that they used VirtualBox to deliver a pre-packaged working environment with APEX workshops ready to go - but for me a waste. Others found it useful. I took the time to catch up with a few people, drop my bag off at the hotel, then meet the depleted team for a beer or three at the local. What I will take away from this is the discovery of VirtualBox. A good session covering all things Oracle cloud, although at times a little too salesy. Even though I just experimented with and built a mobile application with APEX, I was keen to see what they had to demonstrate. I learnt a few things, it's certainly a big learning curve to climb, but I already crossed many of the bridges mentioned. I think it was a well received session from the crowd. 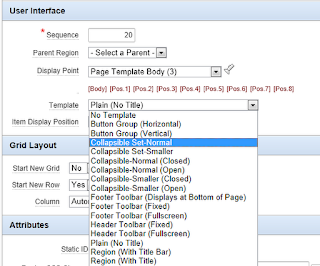 2) Using build options to display debugging information such as session state in a global page (page zero) region. What I picked up from this session was delivery tips from Martin. I know APEX security fairly well, and Martin joked that I should have been delivering that session. From my perspective in the crowd as a presenter & part-time trainer - I took the opportunity to see how Martin delivered this topic. What I should have expected, but not what I was hoping for. David talked about the mechanics of infrastructure & delivery - again involving the cloud, and at the end of day 2 it was getting a little dry. 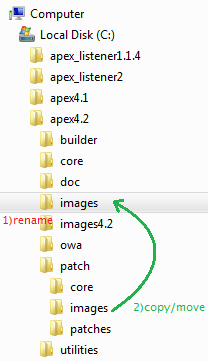 I was hoping for more real-world scenarios of how people manage version control of APEX applications, for instance. Common problems people face moving & versioning applications between environments. In saying that, David suggested maybe perhaps a fairy said in future there may be something going on with Editioning. Do look out for a post coming up from me regarding APEX_APPLICATION_INSTALL - there were a few questions relating to this, and I have some content to share. Ended up being a little short, I think everyone was tired & their brains were full. While the questions were good, there didn't get too deep since we were all tired. I look forward, however, to reading the best practices book. For beginners it would have been a wealth of information, there was even fair call occasionally to the DBAs in the room. Intermediates would have had a number of good sessions each day. I'm happy with my output - picked up a dozen good tips, and assert the understanding & opinions in other areas. I also paid note to the way everything was delivered, a few things caught my eyes & ears. For all it should have been a valuable networking experience. I do hope if the event were to be replicated in some form in future, I would like to see time dedicated to more advanced. I imagine the topic lineup may differ in future, the release of 4.2 almost wrote the agenda itself. I think Melbourne location was good for everybody, but I'd always invite people to Perth. Same standard of speakers. Martin & David were very good. I don't think it would hurt to involve locals in some sessions. I feel people are more attentive when more speakers are present. Major logistical improvement would be to increase the amount of power outlets - it doesn't need to be 1 for 1, but increase the ratio. People get resourceful. Unless of course batteries undertake massive improvements in the next 6 months - or these ultrabooks with SSDs truly hard power friendly. One day dedicated to the basic-intermediate skill level, talking about latest new features & developments, perhaps some standard topics & problems featured in detail - enough to keep everybody interested. I'd go to see that, and tell my friends. And if I had it my way, I think that content could fill three days, not two. Today I picked up my copy of Oracle APEX Best Practices. There have been some quality APEX books come by over time, but I'm a little excited about this one. The contents looks interesting, and it will be interesting to see how the authors talk about best practices now that APEX is really starting to mature. Congratulations to to the 2012 Perth AUSOUG Conference Best New Speaker: Matthew Carrigy - Department of Finance. 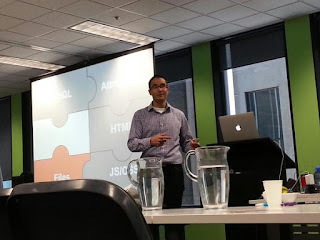 Despite being sick from food poisoning from the day before, he still came in to deliver his components of an interesting case study on an Oracle Forms to ADF conversion project. He was clear, presentable & he covered the technical aspects quite well. I certainly don't want to take anything away from the other new presenters we had at the conference - a few to choose from. There were some well though out presentations, but Matthew shone a little brighter. I know the news is a little late, but I was trying to acquire a photo to accompany the announcement. This one's real quick - something handy for later. I've done some similar before for all days/weekends of the year, or the ubiquitous months of the year. And I think it's going on right now. In April, Christian Rokitta blogged about Categorizr. He adapted some PHP code from Brett Jankord and suited it to PL/SQL. When I was building the mobile application for my AUSOUG presentation, I found it useful for statistics gathering... but I wanted more. I added a few more functions, and included an object type to allow queries shown further below. I think I've done well to cover the major data sets. 0.1        30- 3-2012  crokitta         Created this package. the HTTP_USER_AGENT, which naturally only succeeds when called through a web gateway. 1.0        30-3-2012   crokitta         Created this package. If you were to utilise this package for production code, I would first check it for defects - then question your need to set the user agent in the package body. I might also suggest that as this code matures, it could be added to the Alexandra PL/SQL Library, administered by Morten, expanded/updated by the masses, encouraging other utilities to come visiting. Let me know if you find it handy or have any feedback. Thank you Christian & Brett for the boost. Then you can provide star ratings and some comments if you wish. I also created a special last session so you can provide any general feedback regarding the conference. 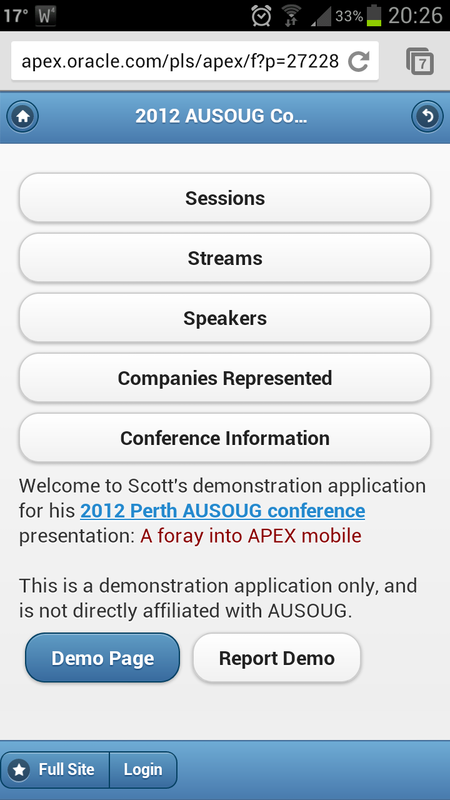 I've added an easter egg to the mobile application that's accompanying my presentation at the Perth #AUSOUG conference. If you can find it you will see the answer to an eyebrow-raising trivia question I'll ask at the end of my session. I'll try find something to give away. At the SAGE booth We'll also have a game you can play with a mobile web browser - more details to come! When I have time I must find out if we can still tweak the APEX login page. The 2012 Perth AUSOUG Conference is less than a week away and it's time for an announcement. 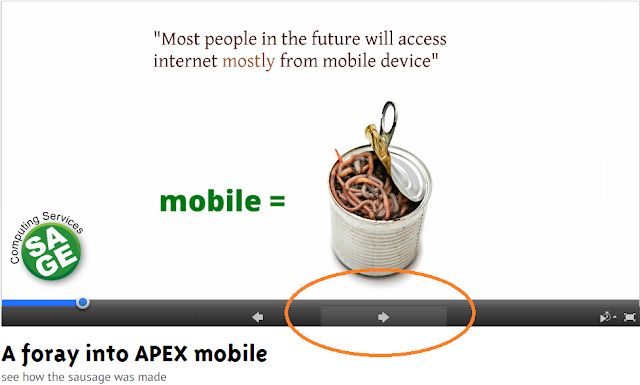 This year I'm presenting "A Foray into APEX mobile", which will be a look into the 4.2 release. Accompanying this will be a demonstration application (apex.oracle.com/pls/apex/f?p=SW2012) that allows you to explore the conference sessions from your desktop or mobile device. The application isn't super beautiful, I only use the stock theme - and I won't guarantee the application is defect free - in fact you may even encounter some APEX 4.2 bugs. I will however do my best to ensure the session times are up-to-date. The conference committee will be interested in the results. We will be promoting the application during the conference & reminding delegates after each session to provide feedback. We plan to formalise & extend the application for next year and integrate it with other services. To those not fortunate enough to be in Perth for the conference this year, I welcome your ideas & hope to see you in the future. Oracle database technologists simply musn't miss the Real World Performance day with Tom Kyte, Graham Wood & Andrew Holdsworth. I attended this last year in Sydney and talk about value for money! Oracle E-Business Reporting users might be interested in attending a breakfast thanks to LogicalTech. Primavera users may be interested in an all day SIG to help them with a wide range of topics and find other Primavera users within Perth. Do you have a SAGE green pig? 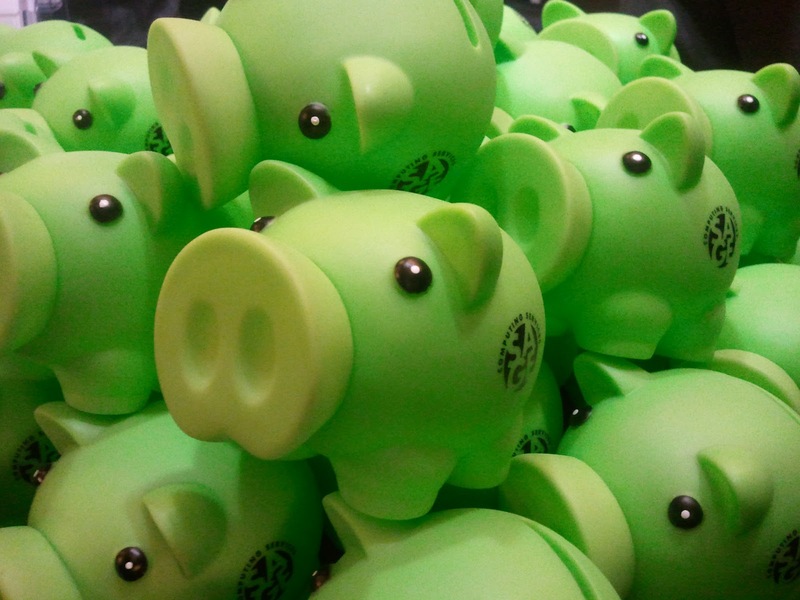 Send them through to us, or tag it on Twitter with #sagegreenpig and you might just see it on the Tumblr! If you don't, come by our booth at the conference and if you're lucky we might have one! 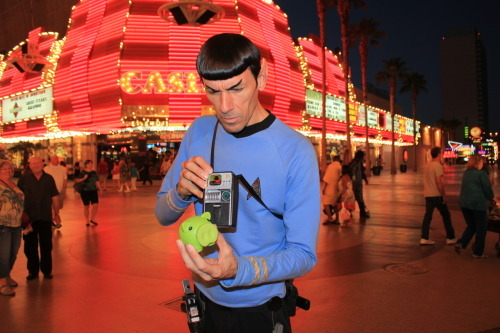 Oh, and they double as a piggy bank! Scott & the SAGE Computing Services team. Oracle Application Express 4.2 is now available to the public, and I thought I'd throw in my 5 cents. For me, I think the biggest two are Plug-ins and Dynamic Actions - they're hard to split. Mobile development is not so much a feature, but a whole new ball game! 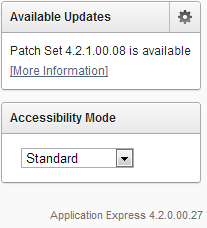 As for APEX 4.2, I notice the public release is 4.2.0.00.27, while apex.oracle.com is still 4.2.0.00.22 - so hopefully some of the small bugs I've been encountering have been rectified. I have had to refrain from installing 4.2 on my laptop as I need 4.1 for a side project a little while longer. Design time bugs can pretty much be ignored - stuff like using previous through the wizards doesn't always behave as expected. Some template tweaks would also be handy, but David Peake mentioned in a recent webinar that this was already being looked at. Runtime bugs are a little more annoying - for the first time I've been finding intermittent issues in Chrome when IE works fine - usually it's the other way around! For example, I received a checksum issue on an APEX generated link in Chrome, but not IE. I'm confident these will be quickly rectified, if not already with the fast uptake and use of this new release. 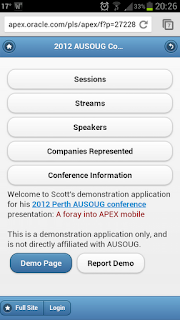 My presentation at the Perth AUSOUG conference will be talking about an APEX 4.2 application with a desktop & mobile interface - more details to come soon! Today the program for the 2012 Perth AUSOUG Conference was announced. First of all, I know it will be a Monday morning but there is a reason not to miss the opening address - we have invited ultra marathon runner Bernadette Benson to talk to us about the discipline it takes to stay focused. Tom Kyte - it doesn't matter what they are, and there's two of them!!! Tom Kyte - did I mention he's doing two presentations? It seems the buzz-word this year is mobile development, and this offering won't drown you with it - but instead offers a great cross-examination of what's out there. These are on top of Chris Muir's smart-devices talk. The community is strong in Perth, so we've got to cover many bases. E-Business Suite and other Fusion applications are another must. 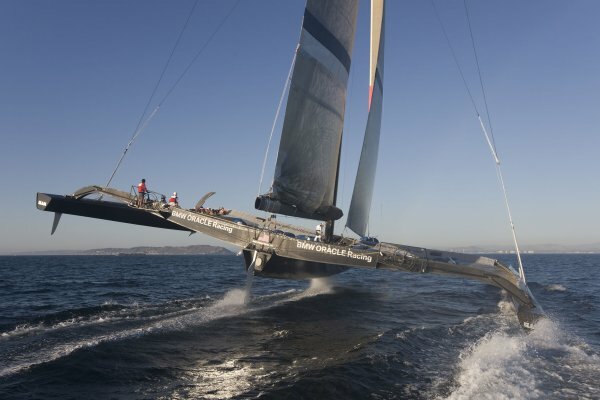 Full day (day 3) - Real World Performance with Tom Kyte, Andrew Holdsworth & Graham Wood. I went this last year in Sydney and it's a must for DBAs and developers. Not only that, it's great value. Welcome reception (day 1) - Let of some steam and enjoy some drinks & nibbles with speakers, delegates, exhibitors & user group committee members. There's even more, and no doubt I've forgotten some sessions that will be a highlight for you. We'll close off day 2 with some thanks from Susan Rooney, Cancer Council CEO & the prize draws. Register now! Early bird special finishes next week. The more I extend my development repertoire in APEX, the more I feel like I'm becoming a web developer as well as an Oracle technologist. I'm still expanding my understanding on the use of jQuery, but every day I feel happier about it and see what such an amazing tool it is to extend APEX applications. 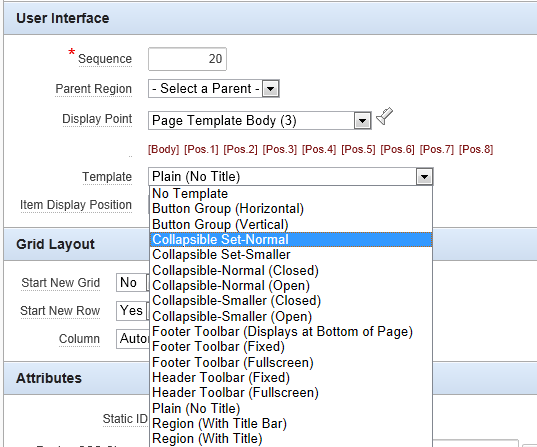 I little example today was to create a dynamic action that fires every time a checkbox on my page is changed. I wanted to do this to show a warning if no checkboxes were ticked, and I didn't want to hardcode checkbox names - so the ideal solution is to use the jQuery Selector selection type. And as a starting point if you're unfamiliar with jQuery, check out the FAQ.